The Family Panel Reviews : Special Feature: Pamper Your Skin with These Great New Products! Special Feature: Pamper Your Skin with These Great New Products! As any Mum will tell you, with all the washing up, hand washing and nappies we change in a day, our poor skin takes a battering. And like most Mum's 20SomethingMum often finds that she safeguards the Tot Testers skin more than her own. So here's some great new products on the market which only need a once a day application to aid in the healing process. The area of a Mum's skin which is always the most affected by dryess due to washing with soap (and often washing up liquids in a hurry) is the hands. We constantly have to wash them after changing bums, before preparing foods, and after craft and other activities. I tried two new products specially for hands. Firstly, I tried Trilogy Rose Hand Cream, which contains Rosehip, Marshmallow and Rose Flower oils. Its very light and easily absorbs into the skin, and its not greasy, something which isn't important until you try and handle a wriggling child with still greasy from hand cream hands. It desn't contain any nasty chemicals either, and has only natural ingredients- as well as the Marshmallow and Rosehip, it also contains Cocoa Butter, Jojoba, almond oils, shea butter, calendula extract and evening primrose- thats quite some list! It smells lovely, and it can also be rubbed into the nails and cuticles to soften them for an instant manicure. Obviously, this all purpose cream, which leaves the skin soft and crack free is a great all purpose product for busy Mums. It costs 9 pounds for 50ml, so it is quite expensive, which will put those on a budget off. However, it does exactly what it promises. Next, I tried Hands First Invisible Gloves. Again, this is a great non greasy cream, and its completely dry. It contains natural ingredients, the same as the Trilogy cream, but it is cheaper, at 4.99 for 75ml. This is fragrance free, so if you not a fan of strong scents or worry that a scented cream will mix with your perfume, then this is for you. Whats different about this cream is that you can feel a film after the cream has disolved, and rather than being designed to be rubbed in after a nappy change or washing up, you rub it in before, and it does protect the hands from being careworn at the end of the day. Wobbly bits, we Mum's all have them! Unless of course you're lucky enough to have the cash to splurge on Lipo, then what can we do to get our Baby ravaged Bods bikini ready? 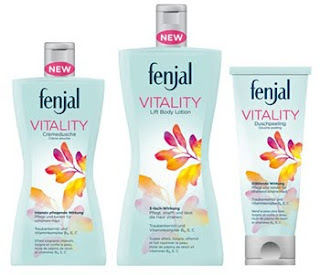 Well, I can highly recommend with a Family Panel Recommendation Fenjal Vitality. This wil be a constant on my dressing table from now on. After two children (one of whom was 8 pounds 6) my formerly 8 stone body has sadly lacked its former elasticity. I have that skin that all Mum's will bemoan. I have used the Fenjal cream for 3 weeks, each night, and I have noticed a tightening of the skin. It contains a triple action process which rejuvenates and nourishes the skin. It contains Grapeseed oil, and is packed with active vitamins B5 E and C complex. This is aimed at Mature skin, but it has left the skin on my problem areas (read whole midsection!) soft and supple. Love this and, at 3.99 for 200ml, its reasonably priced and I urge you to try it. Yes, I am guilty of not always washing the slap off, mainly as I am sometimes so tired I fall into bed and forget! But its importnat for skin of any age to properly cleanse, tone and moisturise. 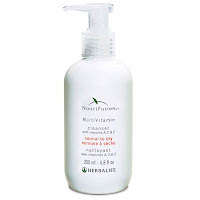 So, I have ditched my usual "Baby wipe method" for 2 of Herbalife's Nouri Fusion Multivitamin range. The cleanser and Toner (both 14.70 for 200ml) contain vitamins A,C and E. They are available for Normal to Dry skin, or for Normal to oily skin too. I tried the dry skin version to see what effect it would have on my sometimes delicate skin. Well these are much better than baby wipes, as they dont contain that sting to the skin that I usually experience! The Cleanser worked very well, easily removing my foundation and eyeshadow, although it did require a few wipes to remove waterproof mascara, but I didn't experience any tell tale panda eye from left over make up in the morning. Both products can be used once a day to help curb spots and leave the skin positively glowing. I have seen a decrease in break outs from make up clogging the pores, and shockingly even felt confident enough to go out without my make up! 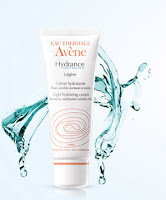 I then finished by moisturising my face and neck with Avene Hydrance Light Moisturising Cream. This is specifically for use on the face and neck to lock in nourishing moisture to the skin, and the face and neck needs as much care and attention as possible as we approach our thrties and beyond. Its suitable for use on sensitive skins, and I can agree with this, as its not upset my sensitivity at all. Another cream with natural ingredients including spring water, it also contains a handy UV filter system which protects against the damaging affects of the suns rays- something which will be more and more important as we approach summertime, and jetting off abroad too. When used after the cleanser and toner, its left my skin feeling great, and I can now see why my gran always told me the importance of good skin care. So, there you have it, fool proof, time saving ways to keep your skin glowing despite the lack of time!